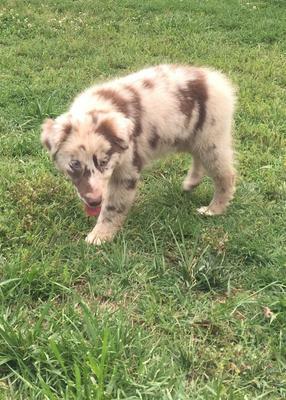 Hello, I will be getting a new Mini Australian Shepherd puppy soon and fell in love with a red merle puppy at a breeders. However, in coming home and researching. I didn't see many dogs on the internet with a similar marking on the face. Can anybody let me know if it may indicate a defect? I saw somewhere that the merle gene may cause blindness or deafness... please help! You can find information about how the merle gene relates to blindness and deafness here. Basically, this occurs when both parents are merles. This results in the "double merle" or "homozygous merle." This results in a lack of pigmentation with the Aussies having more white than normal. The problem is that pigmentation around the eyes and ears is needed during development and without it blindness and deafness can result. Your Mini Aussie appears to have pigmentation in those areas so is likely fine. Those markings are what make Aussies so unique and draw people to them. People look for markings like that. The markings usually get darker with age also. Looks like a beautiful puppy!